Two unsuspecting vintage baseball fans rediscover a "National Treasure." 'BOOMING BATS of the '50s qualify as Grade "A10"
Rediscovery of 42 Major League game-used bats from the '50s leads to nation-wide research pilgrimage. Years before the advent of Buffalo wings, satellite hookups or wide-screen television, Palermo’s neighborhood tavern could take title as America’s Original Sports Bar. Bud Fowler, at right, is the first known black pro baseball player on an intergrated team. SEE THEIR BATS, READ THEIR STORIES: Hank Thompson (above), Willie Mays, Hank Aaron (below) and Gene Baker were among the first black players in the Major Leagues. 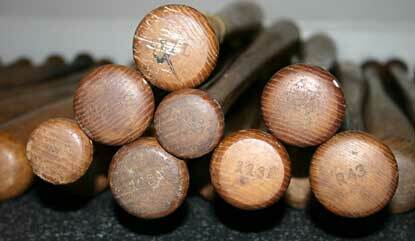 THE BOOMING BATS of the 50's includes a 1955 Aaron model. The field seemed vast to a 7-year old who had looked forward to this day for two months: A Sunday double header against the Braves! HOF KNOBS: We got goose bumps as we realized this long forgotten combination of bats at our very feet were significant baseball artifacts of an era gone by. 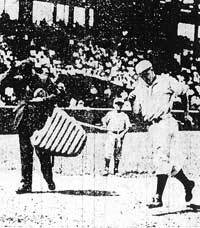 JIMMY PALERMO, center, watches the Brown's Red Kress touch the plate during a game with the Indians in 1931. JIMMY PALERMO talks about that week in May when he "hung" Red Sox rookie Ted Williams on the wall and then bid his old friend, Yankee super star Lou Gehrig, a final farewell.